I made this! It’s big and chunky and has a good weight to it. I kind of love it. The macrame band came together in mere minutes though securing the ends and sewing the clasp on took a bit longer. It was still a really quick and very satisfying project. I made it using a simple square knot. I just overlapped the ends and sewed on a simple snap. – Macrame is seriously underrated. – At this point in the project I’m feeling like I could make nearly any accessory item I might want. – There is nothing like a quick win to energize a person. I might make a few more of these and put them on Etsy. Would anyone be interested in buying them? Check back next week for a project using either glass or lasers (or both?). Macrame at its heart is just a series of knots, but once you learn enough of those knots you can make really elaborate pieces. Those friendship bracelets we all used to make (and that are once again in fashion) were a type of macrame. This means that if you take the time to learn a few different knots you could be the envy of all of your teenage friends. I think it was the old friendship bracelet craze that introduced me to macrame. I was tired of plain knots and was on the lookout for something different when I discovered the twisty spiral stitch knot. It was probably in an old 70’s craft book of my mother’s. Now we have the internet and the whole world of macrame is open before us. 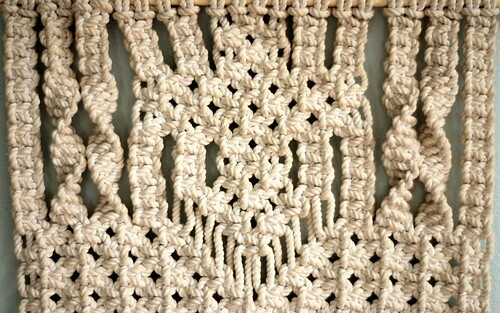 My favorite site for learning is Free-Macrame-Patterns.com. It came through for me when I needed a plastic egg hanger for my music wall. I like the huge variety of knots it has available and the (mostly) clear diagrams. Check back tomorrow for my watch progress. You’ll be amazed at how quickly you can make neat stuff with macrame! Shopping for a project like this can be either fun or frustrating. Some projects come with a tidy list of materials which you go to the store to pick up. Others require a bit more imagination. For this project I had an idea of the kinds of materials I would need but I had no clue if my local craft store of choice would have them. A good meandering wander through the store turned up everything I needed in three different sections. The hunt was kind of fun. Oh, and I decided to turn my bracelet into a watch. I’m excited to start! Have you ever tried macrame? This fiber art uses a series of knots to make interesting textiles. 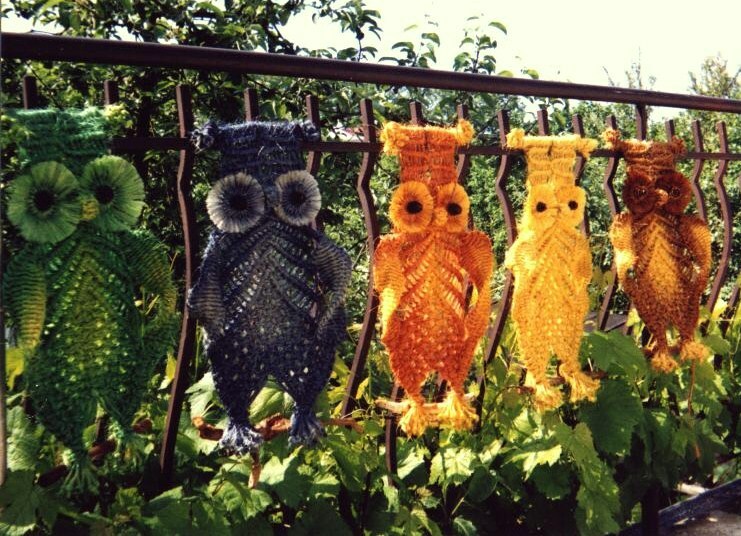 Decorative macrame items like plant holders and wall hangings were popular in the 1970’s but not so much anymore. So why am I doing this project? A friend was wearing a bracelet recently that I had thought was macrame, but when I got closer it turned out to be something else. Still, the idea of that macrame bracelet stuck with me and I’d like to see if I can create it. You are currently browsing the archives for the macrame category.